Dino Dan featuring Might Machines is a cool movie about a boy who has a great imagination to see Dinosaurs everywhere. He helps them as they teach him all about different dinos. I think my son would find this show great. He likes dinos and says "Roaaar" when he sees them in books we read. We are happy to be able to share a great giveaway for one of our lucky readers! 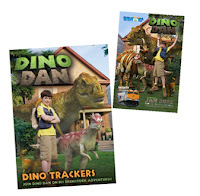 Dan figures out how to prove if dinosaurs were warm-blooded from Jim the reptile lizard and his puppet Denny the Dromaeosaurus. 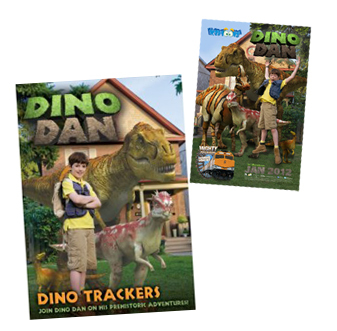 When a T-Rex backs down from a Triceratops, Dan learns that the T-Rex is a hunter AND a scavenger! 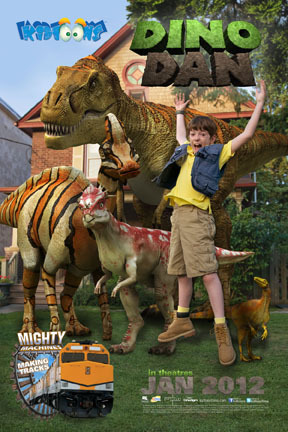 Dino Dan seems like a great way to get kids to have a fun adventure while learning about Dinosaurs. What is yours or your kids favorite Dinosaur? *Limited to US residents; 18 years old and above. Giveaway starts January 6, 2012 and ends on January 28th , 2012 at midnight PST. Winner will be emailed and has 48 hours to respond before another winner is selected. I was not paid for this giveaway or post. The opinions on this item are 100% mine and may vary from others. The sponsor is responsible for providing the prize. Trex, but my son Oliver who is only 2 1/2 seriously knows the names of at least 10 dinosaurs---and when we're playing he corrects me if I call one a wrong name! He loves Dino Dan! i like kidtoons on fb! My son loves the dinosours on the Land before time. I liked Kid toon on facebook. I follow Kid Toon on twitter.